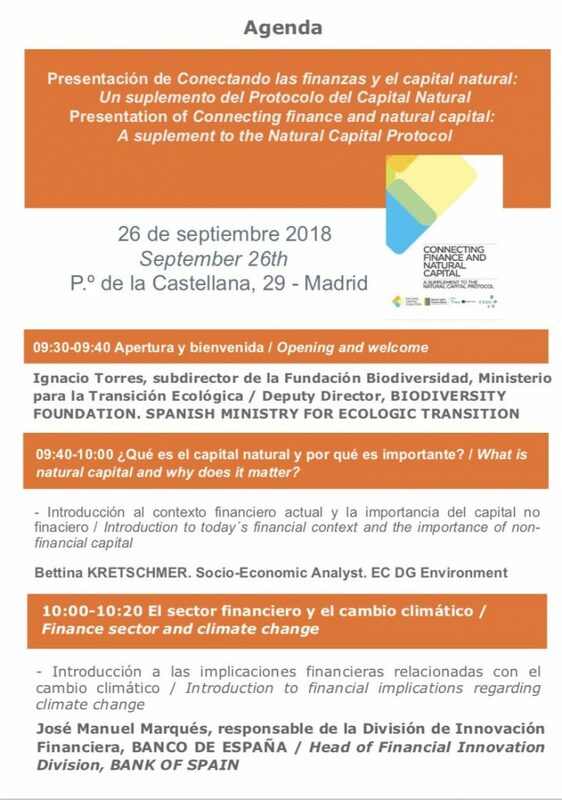 Join us next September 26 at the official presentation in Spain of the Financial Supplement to the Natural Capital Protocol, which will take place at Bankinter Madrid headquarters. The publication provides financial institutions with guidance to better understand the relationship between their investment portfolio and the risks and opportunities associated with natural capital. This opens a range of possibilities to re-orient the strategy towards more sustainable investments for the benefit of the natural world, economy and society, in line with the European Commission Action Plan on Sustainable Finance presented last March. This plan takes into account relevant work developed by groups of experts on climate, environment and sustainable finance such as the guidelines on non-financial reporting adopted by the EC in June 2017 and the final recommendations report of the Task Force on Climate-related Finance Disclosure (TFCD), which seeks to facilitate the disclosure of non-financial information related to the climate of any sector and jurisdiction. The objective of the Action Plan on sustainable finance is to align the financial sector with the specific needs of the European economy focused on making progress towards sustainable and inclusive growth; adequate management of financial risks derived from climate change, natural disasters, environmental degradation and social issues; and promoting transparency and the long term in financial and economic activity. Connecting finance and natural capital: A supplement to the Natural Capital Protocol arises precisely to provide financial institutions with a standardised framework to assess and measure natural capital impacts (negative and positive) and dependencies of their portfolios. This information is critical to know the risk exposure of their portfolios, as well as the investment proposals that come to them. The document is the result of a collaboration between the Natural Capital Coalition, the Natural Capital Finance Alliance (NCFA) and the Dutch Association of Investors for Sustainable Development (VBDO), and guides financial institutions through the process of identifying, measuring and valuing material risks and opportunities as a means of informing financial decision making. In addition, it is also of great value for reporting non-financial information to investors and other stakeholders. The Finance Supplement to the Natural Capital Protocol is the result of a consultation process carried out throughout the world, in which pilot projects for the implementation of the Protocol have been conducted by banks in various countries. Bankinter has represented Spain in this process, with a case study implemented by Ecoacsa. The Natural Capital Protocol is the first harmonized global framework to facilitate companies to measure and assess natural capital positive and negative impacts and dependencies of their operations. It has been designed to generate trusted, credible, and actionable information that can be used to inform decisions around operational, market, reputational, and societal risks. It can also be used to identify and unlock opportunities for innovative solutions in a changing market. The presentation of the next September 26 is framed within the actions of The Hub, connection point of the Natural Capital Factory with the European and global natural capital movement. Click on the following image to download the agenda.